To many people, it seems little has changed in Florida since 2000, when the U.S. presidential race was decided by the Sunshine State more than five weeks after Election Day. Voting irregularities were also uncovered across the state. Listen to The Florida Roundup from Nov. 16, 2018. On Thursday, Broward County, Palm Beach County and Hillsborough County missed the deadline for the state’s automatic machine recounts -- Broward by a mere two minutes. 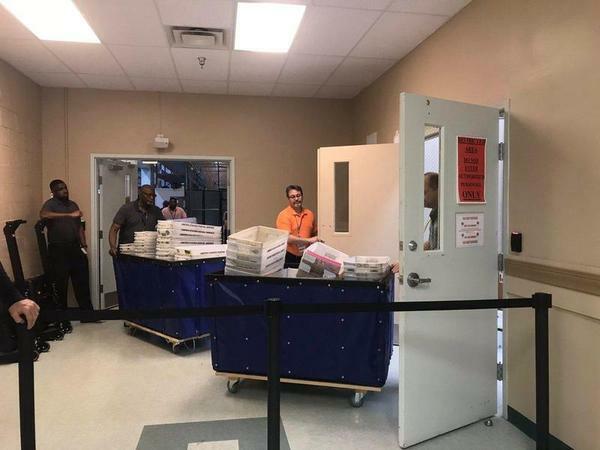 Part of what delayed the machine recount for Palm Beach County was a technical problem that forced hundreds of thousands of votes that were counted by machines to be recounted. All counties across the state now must complete a manual recount by this Sunday afternoon in the race for agricultural commissioner and U.S. Senate. Elections experts say Florida faces a number of issues when it comes to tallying votes, including unreasonable timelines and an overwhelming amount of mail-in ballots, plus outdated machines. In 2002, after the Bush v. Gore debacle, the Republican-controlled state legislature enacted laws to avoid future recount chaos. “They did not like the [Bush v. Gore recount] process, so they put strict deadlines to make sure the process would end. And those deadlines are not serving the state or the nation at this point,” he said. The state’s electorate has grown enormously since 2000. And mail-in ballots have proven to be a particular challenge for officials. Whereas there were less than a million mail-in ballots in 2000, now 2.5 million people cast via mail. Except for overseas and military ballots, mail-in votes must be in the county supervisor of elections office by the time the polls close on Election Day. Mail ballots are also vulnerable to problems with voter identification. More than 3,600 mail-in ballots cast on Nov. 6 were tossed out because of mismatched signatures, according to Florida Division of Elections Director Maria Matthews. That tally does not include some of the state’s largest counties, including Duval and Miami-Dade County. Even former Congressman Patrick Murphy, who’s leading the transition team for Agriculture Commissioner Candidate Nikki Fried, said Thursday on WLRN that his signature wasn’t verified and he was required to contact the Palm Beach County Supervisor of Elections to confirm it. A number of states allow voters days or even weeks to “cure” a mismatched signature on a mail-in ballot. For instance, in Washington voters get 21 days; in California they get 18 days. In Florida? Voters must cure their ballots one day before the election. John Mills, the former Speaker of the Florida House and Dean Emeritus, Professor of Law, and Director of the Center for Governmental Responsibility at the University of Florida's Levin College of Law, said he sees "significant problems in the signature issue." "The problem is, if you’re going to have mail in, there has to be means of verification. Either signature or something else and process for verifying it." That's why "the manual recount is really important because humans have to have standards because we're fallible," he said. "It's the committment of the state and democracy to try to make votes count." Experts also called for the state to ensure that voting equipment is up to par. Historically Florida has had a decentralized electoral vote counting process, with power in the hands of individual counties and supervisors. So counties often pay for equipment. That equipment is then certified by the state to be used in elections. So the machines malfunctioning in Palm Beach county are "not just a Palm Beach problem," Sancho said. "Why did the state certify Palm Beach's counting devices if they couldn’t do the work?" After all, Florida appears set to remain a purple state for the foreseeable future -- which means more razor-thin margins are likely in future elections.